Every time I decide that I have enough dice rolling games, especially of the press-your-luck style, something new and shiny comes along to change my mind. Oh how I do love the shiny. And that brings us to our newest Kickstarter of the Week, the dice rolling game Ninja Dice. This game first got my attention because of its awesome theme. I mean, who doesn’t love a good ninja. Well maybe pirates, but we all know that a ninja would win that fight. Anyway, I thought to myself, do I need another dice game. I guess the answer is yes because Ninja Dice looks really cool and has some unique mechanics as well. • Each turn in Ninja Dice you’ll create a House filled with challenges and use your Ninja skills to beat them. Move Quick! The other Ninjas are also rolling dice to attack you, and each other, because the Ninja with the most treasure wins! • Ninja Dice introduces a mechanic that allows certain dice to modify other dice based on how they land. Dice that have a line on their front edge can modify other dice partially or completely in front of them, like an arc of fire. 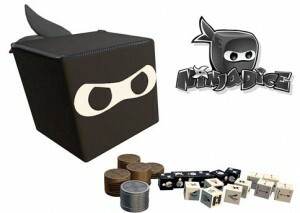 • Ninja Dice is also different because every time the active player rolls the other players roll against them. If the active player re-rolls, so do the other players. • Unlike many dice games Ninja Dice is not a multi-player game of solitaire! I like the idea of dice being able to modify other dice based on where they land, not just their face. That was a pretty good idea and I’m really curious to see how it plays out. The other thing I like is that the other players are actively working against the current player. One of the main draw backs of most dice games is that other players usually just watch while a player takes their turn. So kudos to Greenbrier Games for coming out with a fresh idea. If you are interesting becoming a backer, a $25 pledge will get you a copy of the game and all stretch goals. Speaking of, the game has already passed its funding goal and is well on its way to unlocking a few of those. Ninja Dice is scheduled to be in backers hands in April of 2014. If you’d like to become a backer, you have until Tuesday Oct 29, so head over there today.